Yes, it is here, after more years than I want to admit! Fresh, new, easier to navigate, and easier for me to update. I am excited and revved up to go, and I hope you will click around to see how it has all been arranged. I cannot wait to use this page’s feature, which works like a blog. Some entries will be quick and newsy, and others will be more like blog articles, depending on what I feel like musing about. I am also very excited that my Parlor Talk community now has its own private space. Current Parlor Talk members will receive the log in info in an email newsletter soon. If you want to join, just click on the link in the menu at the top and follow the directions. As for current news, I am now writing a column for the Happy Ever After blog on USAToday.com I hope that you will visit and look for it. Titled Romance Unlaced, my column is put up every 2nd and 4th Wednesday of the month. Links to my published columns can be found on the left margin of this page. There is still work to be done in some of the content, but we are on our way. Let me know what you think of my new cyber home! Thanks to everyone who contributed to the success of The Counterfeit Mistress! It made the USAToday list during a very competitive month. I am also grateful to all of you who wrote reviews of it at the various online sites. Cover reveal! The fourth and final book of The Fairbourne Quartet will be released June 3. 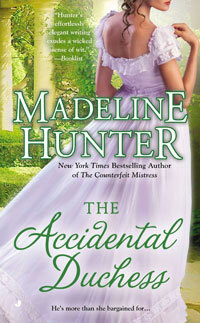 It is titled The Accidental Duchess. Readers have already met the two main characters, the proud Duke of Penthurst and Lydia, the Earl of Southwaite’s “problem” sister. Doesn’t the cover look light and fresh? I love it. Happily on the shelf, and a self-proclaimed “woman of the world,” Lydia hides secret dreams, grief, and unorthodox ideas behind an enigmatic, unrevealing expression. Readers, however, have glimpsed the real Lydia in the ways she interacts with Emma and Cassandra in earlier books. Restless and hungry for excitement, and rebelling against the constraints put on her by society and her family, she has recently taken to gambling, and shown uncanny luck at the tables. When she finds herself in need of a large amount of money, fast, she takes up a wager from the duke, one that she assumes she will win. With one draw of the cards, however, her whole future will change. Penthurst has known Lydia her whole life. In fact, upon her birth, his aunt and her mother made a pact that the two of them would marry, a bit of antiquated nonsense that he publicly repudiated upon inheriting the title when he was fifteen. He has had little contact with Lydia in recent years, and she is not too demure to explain that the reason is because she does not like him one bit. Suddenly, however, he finds himself rescuing her from one disaster after another and getting little thanks for his trouble. When she creates a situation that accidentally compromises her, the only solution is marriage. Lydia is the only woman in the world who does not want to be a duchess, however. He almost has to drag her to the altar. An unruly young woman. An arrogant duke. A marriage of obligation. A duel with reasons and consequences no one has guessed. A cunning blackmailer and the burden of secrets— The Accidental Duchess follows the rocky path, sometimes poignant and sometimes hilarious, that these two people trod toward trust and love. An excerpt will be up in a month. It is available for preorder now. Other news— You may have learned that The Goddess Blogs, in which I participated, has ended. You will find me around and about in cyberspace, visiting other blogs and being more active on Facebook and other social networks. You can “Like” me on Facebook here. I am hard at work planning my next series, which will be a trilogy. There will be no reveals on that until I know I have it nailed down the way it will remain. It is always exciting for me to start a series, however, so I am having fun world-building and creating characters. If you are a member of my Parlor Talk group, you should have received a mailing of your requested bookmarks, along with a little charm themed to The Counterfeit Mistress. If you signed up and requested bookmarks, and did not get an envelope, contact me through any of the links on my site that allow you to send me a message. Any reader can join Parlor Talk here. If you are reading this in December, have a good holiday season! And everyone have a Happy New Year!